It's been a busy summer here, with not much time left for posting my latest finds. In fact, today is really the last day of summer for most people, as schools reopen tomorrow. But today is all about lounging outside and enjoying the sunshine, as Americans flock to beaches and parks for the Labor Day holiday. 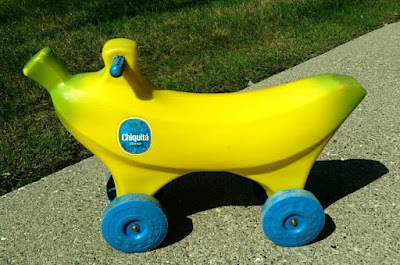 And what better way to do that than by banana car? This fabulous 2 foot long ride-on banana was made in the late 1960s - early 70s and sold in grocery stores as a promotional item, along with its partner, the Heinz Pickle car, featured in the previous post. For another unusual vintage ride-on toy, check out the Mr. Potato Head car.